Rome is a city full of and known for its landmarks - buildings and places which are easily recognized. There's the landmark Colosseum. There's the landmark Pantheon. There's the landmark Spanish Steps. And there's the landmark Forum. It's very clear even to the architecturally naïve that just one of the Forum's columns, whether cast or carved, whether doric or ionic or corinthian requires a staggering amount of work. Each plinth, each block on which each column stands requires even more work. The attention to detail is simply extraordinary. If carved, both columns and plinths require meticulous filigree delicate chipping away solid marble. 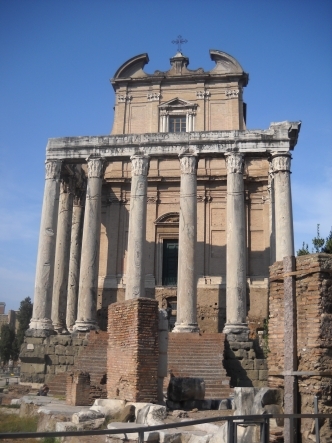 Then multiply all this work by however many columns the Forum requires. Throw in a few monumental statues for good measure ... that, plus a roof or (in all likelihood) a dome. Then exponentiate all that by hundreds and hundreds and hundreds of similar still standing structures built over a period of ... two ... thousand ... years ... and more, and you have just the barest taste of what it took to construct Rome, "the eternal city". It's been said "Rome wasn't built in a day". Really. No kidding! If you can stop yourself just for a moment from being blown away by standing in the living presence of this centuries old - no, millennia old - city, if you can take your mind off all its landmarks and what it took to build each and all of them, you may start to get something else, something at first imperceptible, something akin to a context against which all your awe shows up. It's the context of human being. As you stand in the midst of all this, as you contemplate all ancient and modern Rome's landmarks, you start to realize the time continuum civilized human beings have been around here is two ... thousand ... years ... and more old. And you realize this context of human being then obviously wasn't a whole lot different than the context of human being today. OK, so Julius Cæsar didn't have internet access, and gladiators at the Colosseum didn't stop off on the way to work at the local Starbucks. But the conversation, the set of concerns, the culture of human beings then was hardly any different then than the conversation, the set of concerns, the culture of human beings today. In other words, what stands in the way of, what covers up the possibility of transformation today isn't any different than what stood in the way of, what covered up the possibility of transformation then. But it's more than that actually. What stood in the way of, what covered up the possibility of transformation then has had two ... thousand ... years ... and more to solidify, to coalesce, to gel, to get practiced at standing in the way of, at covering up the possibility of transformation today. Now, to put this in perspective, in the history of time, two ... thousand ... years is but a blink of an eye, and transformation's been around since before time started. But looking at what there is to get over, at what there is to get off of today to clear the space for real, lasting transformation to show up on the planet, we've got two ... thousand ... years and more of civilization, of solidification, of coalescence, of gel, of practice which stands in the way of, which covers up the possibility of transformation today to get over. The resistance didn't start yesterday. It didn't even start in your childhood. It goes back further than that, much much further than that, waaay further. We, the people of Planet Earth, have been skewed since antiquity. Literally. Enter transformation: stage front and center. Transformation defies the linear conversation. If transformation took two ... thousand ... years and more of civilization to arrive here now, then it's arrival here now is irrefutable evidence we've always been transformed like a possibility. If only once during those two ... thousand ... years and more of civilization, especially in ancient Rome when the Forum was first constituted, transformation was experienced by one or more people (and there's good evidence it was), then it didn't happen two ... thousand ... years and more ago: it happened NOW! If we, You and I, are transformed here and now, then so were the people of ancient Rome in the Forum two ... thousand ... years and more ago like a possibility. That's us, the people of Planet Earth today and the people of ancient Rome in the Forum: skewed since antiquity, and at the same time always transformed like a possibility.